Natural formula of Dead Sea mud combined with natural Beech Tree Buds Extract formulated to eliminate impurities and dead skin cells, while Beech Tree Buds extract tightens and help reducing of fine lines and wrinkles. Leaves skin toned and youthful looking. Direction of use: Gently smooth mud over clean face and neck in an even layer. Wait 20-30 minutes until the mud is completely dry. Exfoliate gently with fingertips. Rinse with warm water. 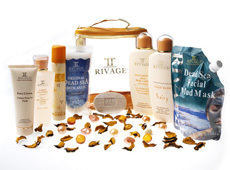 Follow with Rivage facial care moisturizer. Apply once weekly.